A man who represented himself in court pleaded guilty to behaving in a threatening or abusive manner towards a woman and trashing a house. 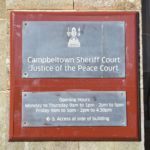 Connor Thomas George Francis Miller, 26, of Ciaran Court, Campbeltown, admitted shouting, swearing and acting in an aggressive and intimidating manner towards the woman at the house in which he lived on July 1 last year. He also admitted damaging items in the house by maliciously repeatedly kicking internal doors, throwing a kitchen table, from which crockery fell, and slamming the back door, causing its glass to smash. Procurator fiscal depute Eoin McGinty told the court that Miller returned to the house at 4am and, ‘for no reason’, began shouting and swearing at the woman, grabbed her by the throat and dragged her from the sofa on which she had been sleeping. The incident was reported to police at 7.25am and Miller was traced nearby and arrested, admitting his abusive behaviour to officers. Miller, whose mother was terminally ill at the time, told the court: ‘You have to bear in mind the situation – my mum was dying in hospital. He added that the matter had already been resolved between him and the woman.